The original Star Wars three-film release debuted in the late 1970s and continued into the early-to-mid 1980s, setting the stage for a global phenomenon that continued to grip the imaginations of adults and children alike for two decades. Eventually, the originally trilogy was followed up by a prequel trilogy of films released at the turn of the 21st century, and now Star Wars returns to theaters to grab the attention of an entirely new generation of people with a new trilogy series following the aftermath of the original films. As if a new trilogy wasn’t enough to excite the millions of Star Wars fans in the United States and around the globe, the latest installment of films will also include stand-alone feature film releases that aren’t part of the new trilogy itself, but fit into the timeline between the three sets of trilogy collections. Star Trek might already have a jump on precious metal coin collections with a rising profile in the marketplace, but when it comes to the world of science-fiction there is no franchise more popular than Star Wars. 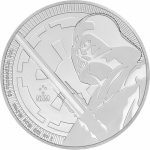 To counter the influence and benefit on the popularity of Star Trek, An entire series of Silver Star Wars coins are currently available from the New Zealand Mint, issued for the tiny island nation of Niue. Some of the coins feature stunning colorized proof finishes with limited mintages, while others are available in brilliant silver finishes. 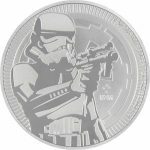 Explore a galaxy far, far away in the following paragraphs as we walk you through the collection of Silver Star Wars coins in the online catalog at Silver.com. The original Star Wars trilogy of films, launched in the late 1970s, set the stage for what would become one of the greatest box office anthologies of all time. The original films gave the world many of the most beloved characters in the history of the franchise; many of which are still immensely popular today even in the face of countless new movies arriving in theaters from the collection. Mintage limited to 10,000 coins only per release! Ships to you encapsulated in plastic in a protective black display case. Features a Certificate of Authenticity. Face value of $2 (NZD) is legal tender in Niue. Obverse design of the the right-profile portrait of Queen Elizabeth II. This image was designed in 1998 by Sir Ian Rank-Broadley, and captures Her Majesty in a fourth-generation depiction. 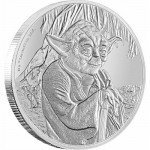 Star Wars Yoda Coin (3rd Release): Yoda is captured on the 2016 1 oz Silver Niue Star Wars Classic Yoda coin as he appeared inStar Wars: The Empire Strikes Back. He made his appearance when he trained Luke Skywalker in the ways of the force so he could better lead the Rebellion. Star Wars R2-D2 Coin (4th Release): Without the spunky little R2-D2, lovingly referred to as just Artoo, it is conceivable that Luke Skywalker might never have met with destiny. It was Artoo’s determination and resourcefulness that helped guide Luke to the Jedi Knight Obi-Wan Kenobi in the open film of the Star Wars franchise, initiating his involvement with the Rebel Alliance. Star Wars Obi-Wan Kenobi Coin (5th Release): One of the most popular characters from the original Star Wars trilogy of films was Obi-Wan “Ben” Kenobi. Kenobi’s character appeared first in the original trilogy as an older version of himself, portrayed by actor Alec Guinness as one of the few remaining Jedi in the universe, and famously had a show down early on with Darth Vader. 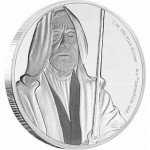 The reverse side of the 2017 1 oz Silver Niue Star Wars Obi-Wan Kenobi Coin features the image of Obi-Wan in his Jedi robes as he draws his lightsaber to face Darth Vader on the Death Star. This is one of the iconic moments from the first film, Star Wars: A New Hope. Whether you were alive when the original trilogy hit theaters or were introduced to it as a child, odds are you were in the theaters at the end of 2015 to see the release of the first film in the highly-anticipated new Star Wars trilogy. Set in future existence beyond the timeline of the original three Star Wars films from the 1970s and 1980s, the release of Star Wars: The Force Awakens dominated global box office news and ticket sales for weeks. Ships to you in a protective presentation case. Bears a face value of $2 (NZD) and is legal tender in Niue. Each coin in the series shares a common obverse design, that of Queen Elizabeth II’s right-profile portrait. Designed in 1998 by Ian Rank-Broadley, this represents a fourth-generation of Her Majesty as the Queen of England. 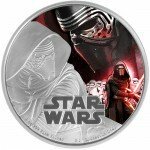 2016 Kylo Ren Coin (1st Release): On the reverse face of each 2016 1 oz Silver Niue Star Wars Kylo Ren Coin are multiple images of Kylo Ren, pulled directly from the feature film. The colorized background shows Kylo with his fearsome lightsaber as he leads a group of storm troopers. Above this is a side-profile image of Kylo that is also colorized, while the foreground features a silver image of Kylo Ren. 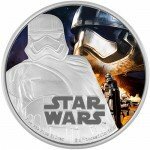 2016 Captain Phasma Coin (2nd Release): The reverse side of the 2016 1 oz Silver Niue Star Wars Captain Phasma coin brings his character to life with three images. He is featured in colorized designs that include his distinctive metallic armor as he leads the legions of storm troopers for the First Order. 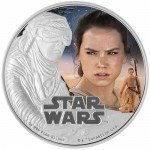 2016 Rey Coin (3rd Release): On the reverse of the 2016 1 oz Silver Niue Star Wars Rey Coin are three images of Rey from the feature film. In the only silver image, we see her cloaked in protective gear to cover against sand as she speeds across the desert landscape. The two colorized images show a close-up image of Rey and a full-length shot of her character with the Jakku sky in the background. 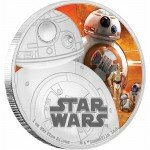 2016 BB-8 Coin (4th Release): On the reverse of all 2016 1 oz Silver Niue Star Wars BB-8 Coin you’ll find three images of the lovable droid. One is captured in brilliant .999 pure silver, while the background images are colorized. In one background image, we see only BB-8, but the other shows him near the end of the film when he encounters C3PO and R2D2 as the story begins to weave together with the past in this iconic franchise. 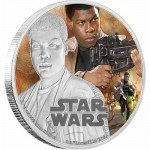 2016 Finn Coin (5th Release): The reverse of the 2016 1 oz Silver Niue Star Wars Finn Coin depicts this main character in the same manner as others in the Force Awakens Series. Three total images of Finn appear on the surface, with one close-up in silver and the background field entirely colorized. Another close-up of Finn is featured in the colorized background, along with an action shot from the film. 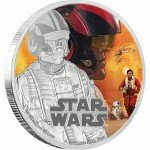 2016 Poe Dameron Coin (6th Release): Poe Dameron appears on the reverse of each 2016 1 oz Silver Niue Star Wars Poe Dameron coin with three images in total. In one he is featured in his X-Wing fighter pilot suit in pure silver, while another close-up right-profile portrait captures him in his suit in full color. The background is entirely colorized as well, with an action shot from the feature film. While fans await the follow-up to 2015’s release of The Force Awakens in theaters, they still have something to look forward to for December 2016: the release of Star Wars: Rogue One. This film is unique in that it is not part of the follow-up trilogy that launched in 2015 with The Force Awakens. Instead, for the first time in Star Wars history there will be a stand-alone film in the anthology. Rogue One is set in the Star Wars universe in the time following the events of Star Wars: Episode III and before the events of Star Wars: Episode IV. Ships to you in a Star Wars-themed black box with commemorative shipper and Certificate of Authenticity. 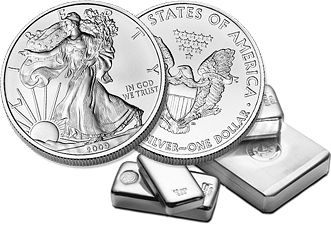 Consists of One Troy ounce of .999 fine silver in proof. The obverse side of each Star Wars Rogue One coin includes the right-profile portrait of Queen Elizabeth II. The British monarch appears on the obverse of all commonwealth coins, and has since ascending to the throne in 1952. This depiction was created in 1998 by Ian Rank-Broadley as the fourth-generation effigy of the Queen. The Empire Proof Coin: On the reverse side of the coin you’ll find a colorized design mixed brilliantly with the coin’s natural silver finish. 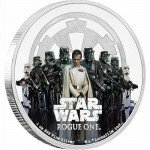 The 2017 1 oz Silver Niue Star Wars Rogue One The Empire Proof Coin features the image of Director Orson Krennic standing in front of a group of the Empire’s most loyal Deathtroopers and Stormtroopers. 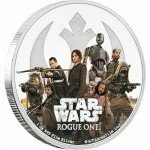 The Rebellion Proof Coin: The reverse of the 2017 1 oz Silver Niue Star Wars Rogue One Rebellion Proof Coin features a collection of characters from the upcoming film that Star Wars fans have yet to meet on the big screen. In addition to the rebellion logo, you’ll find the colorized design of rebel strike team members that include Jyn Erso, Captain Cassian, K-2S0, Chirrut Imwe, Baze Malbus, and Bodhi Rook. Niue is the nation of issue for all Silver Star Wars coins from the New Zealand Mint featured online at Silver.com. A small nation with an outsized presence in the precious metals industry, Niue is a truly unique nation. The island of Niue is located in the South Pacific Ocean, roughly 1,500 miles northeast of the nation of New Zealand, east of Tonga, south of Samoa, and west of the Cook Islands. The island itself is just 100 square miles in size and has a predominantly Polynesian population of around 1,190 people. Niue occupies a unique niche in the world order. The nation is a self-governing state that exists in free association with New Zealand. The vast majority of diplomatic relations for Niue are handled by the nation of New Zealand on behalf of the people of Niue, and the populace are citizens of New Zealand with Queen Elizabeth II serving as head of state in the capacity of Queen of New Zealand. Most of Niue’s people, 90-95%, actually now live in New Zealand, along with 70% of those who actually speak the Niuean language. The official languages of the nation are English and Niuean, and the nation’s economy uses the New Zealand dollar as its official currency. When you purchase Silver Star Wars Coins on Silver.com, you’ll find a number of payment methods available to complete your transaction. We accept Visa and MasterCard credit and debit cards, as well as paper checks, Pay Pal transfers, and bank wire transfers. Credit and debit cards have a maximum purchase of $5,000 and generally take one business day to process. 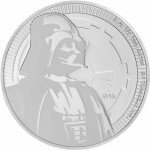 If you have any further questions about Silver Star Wars Coins, please don’t hesitate to ask Silver.com. Our associates are available on the phone at 888-989-7223, or you can connect with us online using our live web chat and email features. 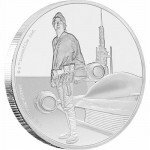 And be sure to check back with Silver.com as future releases of Silver Star Wars Coins from the New Zealand Mint and others!